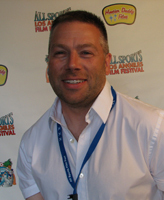 As a documentary filmmaker, a faculty member in College of Arts and Letters’ Department of Film, Television, and Theatre (FTT), and a producer for Fighting Irish Digital Media, Ted Mandell ’86 quite literally sheds light on the University of Notre Dame’s traditions of social justice and student athletics. What unites his approach to these roles, says Mandell, is a commitment to show the human side of every story—and help his students learn to do the same. 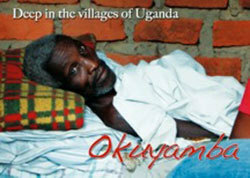 The same goes for the subjects in Okuyamba, Mandell’s award-winning 2011 documentary about palliative care in Uganda. “The patients in Okuyamba are people,” he says. “They’re not helpless, voiceless victims. They have families, friends, personalities. They are people with lives. Co-director Mike Wargo, COO of the Hospice Foundation in Mishawaka, Ind., turned to Mandell when he wanted to raise awareness about the lack of palliative care in Uganda—a country where life expectancy is just 52 years, where HIV/AIDS continues to exact a heavy toll, and where most of the nation’s 33 million residents have extremely limited access to modern medical care. Wargo introduced Mandell to Rose Kiwanuka, the palliative care nurse who would be featured in the film, when she was visiting from Uganda. After hearing her story, Mandell recruited two of his students, Jacob Griswold ’10 and Michelle Carlisle Lee ’10, to accompany Wargo to rural Uganda for a two-week shoot that included interviews with patients, care providers, and leaders in the country’s palliative care movement. The students also played a vital role in the success of the film, which won the National Hospice Association’s Zachary Morfogen Art of Caring Award, an Indie Fest award of merit, a Best Shorts award, and recognition as an official selection at multiple film festivals. “Jake and Michelle did a wonderful job getting coverage and an even better job of organizing their 20 hours or so of footage so that I could make heads or tails of it,” Mandell says. Mandell, who coordinates the annual Notre Dame Student Film Festival, involves students heavily in his sports documentary work as well. 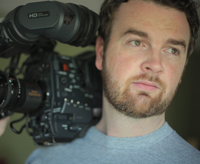 As a producer and director of student development for Fighting Irish Digital Media, he provides training and educational opportunities for students to learn production in a real-world environment. This past spring he also started an FTT course called Internet Television Production in which students put together short features for the official website for Notre Dame athletics. The vignettes are similar in form to NFL Films or the profiles seen on network television’s Olympics coverage. Whatever the subject, Mandell says his mantra is “show me, don’t tell me.” To create impact, his films feature observations of behavior that enable viewers to experience what it’s like to be at auditions for the Notre Dame leprechaun, with the groundskeeper at Notre Dame Stadium as he lines the fields, or with the U.S. Air Force crew coordinating a game day flyover—a film that garnered Mandell an Honorable Mention at the 2012 College Sports Media Awards. 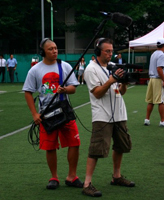 Other recent sports-related work by Mandell includes Inside The Legends: 2009 Japan Bowl, a documentary about Lou Holtz’s last coaching assignment, leading a group of former Fighting Irish players against a squad of Japanese all-stars, which was featured at the 2010 All Sports Los Angeles Film Festival; Heart Stoppers and Hail Marys: 100 of the Greatest Football Finishes (since 1970), a book with audio disc; and occasionally opining online at Notre Dame Magazine. “I’ve been a Notre Dame sports fan since I was in 4th grade,” he says. “My nickname growing up in Kentucky amongst a sea of Kentucky Wildcat fans in the 1970s was Digger. I even played in the ND marching band for four years. Mandell’s classroom has been a launching pad for a growing number of documentary filmmakers whose films are meeting with acclaim and awards on the festival circuit, including Peter Richardson ’02, winner of the 2011 Sundance U.S. Documentary Competition Grand Jury Prize, as well as a number of more recent graduates. “Ted taught us the important lesson of how to treat our footage objectively and critically, to know when enough is enough,” says Dan Moore ’11, recalling how Mandell helped him and Erin Zacek ’11 shape The Elect, their documentary about the controversial Westboro Baptist Church. The film premiered at the 2011 Los Angeles Film Festival, was a finalist at the 2011 Angelus Student Film Festival, and won the Audience Choice Award at the 2012 Visions Film Festival and Conference in Wilmington, N.C. in April. Another recent graduate, Kelsie Kiley ’12, took three classes taught by Mandell, including one on documentary filmmaking for which she and Grace Johnson ’12 created Project Hopeful, a 14-minute film about a nonprofit organization in Illinois that advocates for the adoption of children with HIV/AIDS. “Ted constantly stressed shooting the film in vérité style and taught us to act as flies on the wall when we filmed,” Kiley says. “This truly made all the difference in my film, which could have been created just to easily manipulate audiences to tears. We didn’t want to influence our audience members’ thoughts but rather wanted to provide them with knowledge and questions they might not have thought of before. Originally published by Mike Danahey at al.nd.edu on September 14, 2012.